We already know that "frying" chicken in the oven is much easier than on the stove, but this recipe takes "easy" to a whole new level! 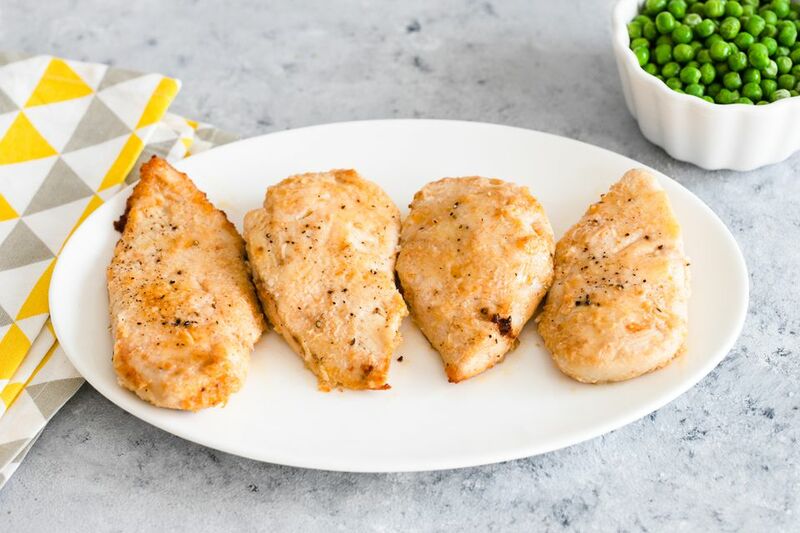 After letting butter melt with oil in a baking pan in the oven, chicken breasts are dredged in seasoned flour and then simply placed in the pan to "fry" in the oven. The coating gets nice and crispy while the inside stays juicy and tender. This recipe calls for boneless chicken breasts, but boneless thighs can be used as well. It is excellent served with potatoes and your favorite vegetables, or slice it and add it to a tossed salad or Caesar salad. The chicken can also be used in casseroles and is a delicious filling for sandwiches. Put the butter and olive oil in an 8- or 9-inch square baking pan (or a pan large enough to fit the chicken without crowding); place it in the oven to melt the butter. This should only take 1 to 2 minutes, so watch carefully to make sure it doesn't burn. When the butter in the pan is melted and sizzling, remove the pan from the oven. Blot the chicken with paper towels and remove any excess fat. Put the flour, garlic powder, and paprika in a bowl or pie plate. Stir to blend thoroughly. Dredge the chicken breasts in the flour mixture. Carefully turn the chicken with a spatula and return to the oven for another 10 to 15 minutes. The chicken should register at least 165 F (73.9 C) on a food thermometer in the thickest pieces. For two servings, reduce the ingredients by one-half and use two tablespoons of olive oil and one tablespoon of butter. For even faster cooking, flatten the chicken breasts slightly to an even thickness, or use cutlets. They will cook quickly, so be careful not to overcook. Turn them at about 10 minutes and check for doneness after another 5 minutes. Add about 1/2 cup of freshly grated Parmesan cheese to the flour mixture along with a few teaspoons of minced fresh parsley, if desired. Add a little poultry seasoning or ground thyme and sage to the flour mixture for herb flavor.